SALON SORA INTRODUCES A FORMALDEHYDE FREE KERATIN SMOOTHING SYSTEM. 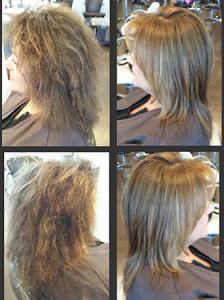 COME IN NOW TO TRANSFORM YOUR FRIZZY HEAD OF HAIR INTO A MANAGEABLE, BEAUTIFUL WORK OF ART! NOW YOU CAN HAVE THAT SMOOTH, SLEEK, GORGEOUS HEAD OF HAIR WITHOUT THE WORRY OF ANY TOXIC CHEMICAL. YES, THIS WAS AN ACTUAL NEW CLIENT THAT NEEDED SOME SERIOUS HELP. YOU CAN SEE FROM THE BEFORE AND AFTER PICTURES HOW SHE WALKED INTO SALON SORA AND HOW SHE WALKED OUT. THE FORMALDEHYDE FREE SMOOTHING SYSTEM EVEN MADE HER WASHED OUT HAIR COLOR LOOK AWESOME! SALON SORA OFFERS FOUR DIFFERENT SMOOTHING SYSTEMS, TWO OF WHICH ARE FORMALDEHYDE FREE AND LAST UP TO FOUR TO SIX MONTHS. THESE SERVICES NOT ONLY SMOOTH YOUR TRESSES BUT THEY ALSO HELP REDUCE BLOW DRYING TIMES UP TO FIFTY PERCENT! COME IN TO SALON SORA TODAY FOR A COMPLIMENTARY CONSULTATION AND WAKE UP TOMORROW WITH THE HAIR YOU ALWAYS DREAMED OF!